The original Section 8 was an unknown quantity launching within weeks of the likes of Halo 3: ODST and Batman: Arkham Asylum. To put it lightly, Section 8 had quite an uphill battle on its hands. Now, developer TimeGate Studios has prepared a disruptive secret weapon: Turning the sequel, Section 8: Prejudice, into a budget download. Based on what I played at PAX East, I'd say it's a strategy that might pay off. Admittedly, my familiarity with the original Section 8 doesn't extend beyond the multiplayer demo and, at first blush, Prejudice's multiplayer looks very similar. As the round begins, players choose from one of several loadouts. There are a few pre-built loadouts, but it's easy to build one of your own. You pick two weapons, an armor pattern, two pieces of equipment -- grenades, repair kits and the like -- and, finally, customize your armor modules. Modules apply a range of effects, from increased damage to improved movement speed. You can mix and match up to ten of these modules to suit your play style, and it's easy to create unique classes suited to different tasks. Once a loadout is selected, you then decide exactly where on the map to spawn, and by "spawn" I mean "drop" -- in real time -- from thousands of feet above the battlefield. You have free reign over the entire map, although certain areas may be protected by enemy anti-air defenses. As a general rule of thumb, you will not survive if you try to jump into the heart of a protected zone. The smarter option is to spawn into a squad or near an undefended base. Also, on a personal note, I totally landed on an enemy soldier and killed him, which elicited a (perhaps too loud) cry of triumph in the middle of the PAX East show floor. One difference between Prejudice and its predecessor was immediately apparent: Combatants are no longer the bullet-absorbing behemoths they once were. 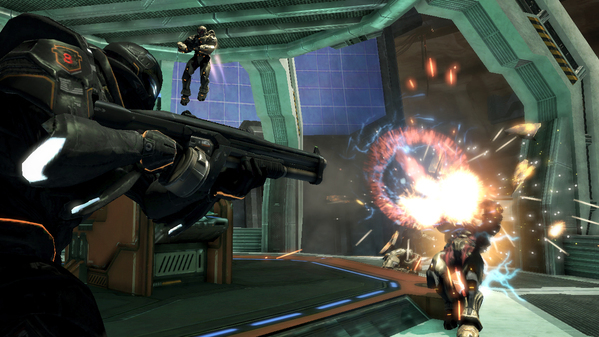 In fact, I was able to down opponents with only a handful of bursts from the new assault rifle. Direct hits with rockets were knocking out confirmed kills as well. This higher damage ratio is a very welcome change, making combat feel much more tense and immediate. The fact that you can summon tanks, turrets and supply depots directly onto the battlefield makes it even more so. I'd say that's the overall sense I got from the entire experience. There were rarely any lulls in the gameplay, as I was always capturing an objective, fending off waves of opposing players or pursuing one of the Dynamic Combat Missions (DCM) -- quick on-the-fly missions that reward your team with more victory points. Thanks to its changing objectives and focus on co-operative play -- every FPS should have squad spawning, in my humble opinion -- Section 8: Prejudice gives me a bit of a Battlefield: Bad Company 2 vibe. That is by no means a bad thing. At only $15, it's starting to sound like a very good thing.